It’s summer, which means its time to enjoy cookouts, pool parties, and camping. However, summer also comes with its share of challenges. One of the most noticeable is the eventual drying out of your lawn. To prevent that from happening to your lawn, try some of these tips to keep your lawn green during the hot summer months. In order to keep your lawn nice and neat, one of your summer chores is regular mowing. After all, you want a lawn, not a jungle outside of your house. However, if you mow too often, you may actually be reducing its ability to grow in a healthy way and maintain that beautiful green color. By allowing your grass to grow to 3-4 inches tall, the grass can prevent weeds from growing. The roots of the grass dig deeper into the soil to absorb the water and nutrients that would otherwise be used by weeds. Taller grass also helps the soil retain moisture for longer by providing cover from the hot summer sun. When you mow the lawn, adjust the height of the blades higher so they are only cutting the top third of the blade. To keep your lawn green in the summer, you may first think about using a fertilizer. This could be a mistake, however, since using fertilizer during the summer might actually harm your grass. If it seems as though your lawn needs a little help, then have the soil tested first. This way you can examine for any deficiencies that your lawn may be experiencing and then use the proper method to treat them. If it seems as though everything is in order, then obtain an organic and time-release fertilizer to keep it from burning your lawn. Otherwise, you’ll be right back where you started. Just making sure that the blades on your mower are sharp will help keep your lawn green. If your blades are dull, they will tear the grass when cutting it. The frayed tips of grass are more likely to dry out and turn brown. To prevent that fray from happening, sharpen your mower blades before you start mowing. Like all plants, grass needs a healthy dose of water to keep a healthy appearance. However, the when and how much is important to consider. If you choose to turn on the sprinklers or the garden hose during the heat of the day, you’re wasting more water than you should. Instead, water your lawn in the early morning so it has time to seep into the soil before the midday heat. Not only does this reduce water consumption, but it helps keep your lawn green by allowing the grass to store that water deeper in their roots. You should also only water about an inch a week. If you water too much, your grass will grow shorter stems which hurts the grass in the long-run and paves the way for weeds to grow. 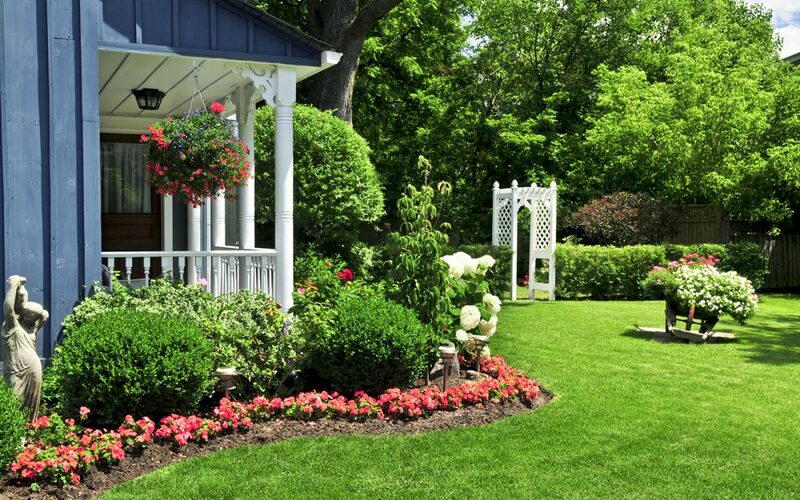 By following these tips, you can keep your lawn looking fantastic throughout the summer. Say goodbye to dry and patchy grass and boost your home’s curb appeal when you keep your lawn green all summer long. Master Home Inspections serves Southwest Virginia with home inspection services for home buyers, home sellers, and homeowners. Contact us to book an inspection.